Melons are a magnificent in their medley of variteties; watermelon, honeydew, cantaloupe, piel de sapo, canary and so on. Delightful in fruit salads or just cut in wedges on their own, melons make wonderful desserts, whether it's something as simple as William Drabble's kid-pleasing tropical fruit rockets, or an elegant offering like Vineet Bhatia's mango baked yoghurt, melon-mint salsa, and strawberry cream fingers. Of course, there's always the savoury option of wrapping a strip of prosciutto around a piece of melon for a tasty antipasti treat. 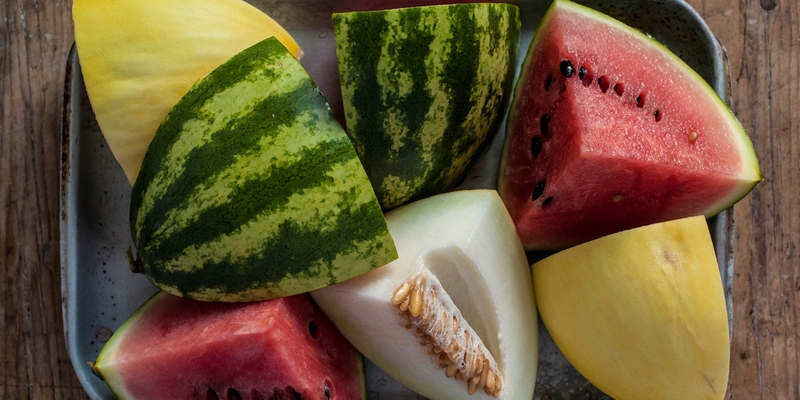 Melon, particularly watermelon, plays well with salty, savoury accompaniments. Josh Eggleton's pickled ewes milk cheese and watermelon salad is a lovely, summery burst of flavour that can be easily upgraded from a canapé to a starter by increasing the ingredients.